This video will show you on how to create connection, Outbound profile and assigning number. The default behavior of FreePBX version 12 is to use chan_pjsip forendpoints and trunks. Selection of either chan_pjsip or can_sip from within your distribution can be found in the Admin Web tool under Settings -> Advanced Settings ->Dialplan and Operational -> SIP Channel Driver. Each of these is configured using the Admin Web tool provided by FreePBX. When adding the new trunk, many settings are available, and most have defaults already configured. You can enter the Dial patterns Wizards. 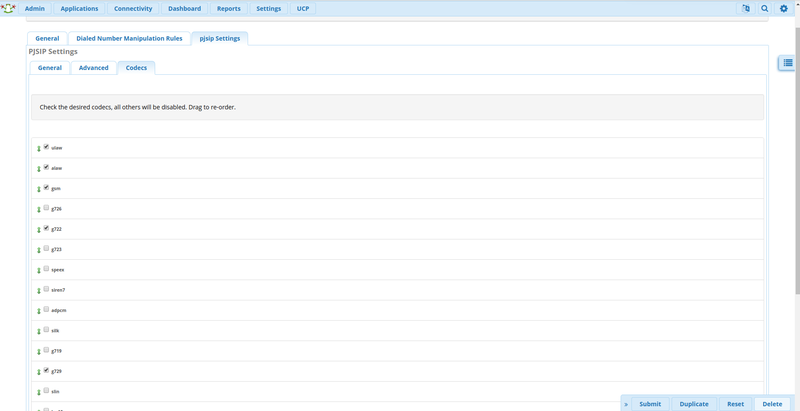 Select the "pjsip Settings" tab and edit the settings under the "General" sub-tab. Select the "Codecs" sub-tab under the "pjsip Settings" tab. Here you should select ulaw, alaw, gsm, g722, g729, Opus. All other boxes should be unchecked. After doing the above please click on submit button at the bottom. Now configurations which you have made has been submitted. Now we need to configure “Outbound Routes”. Select "Connectivity" then "Outbound Routes." To create a new "Outbound Route," you must first enter a distinctive "Route Name." Then select the trunk you just created as the top route in "Trunk Sequence for Matched Routes." Select the "Dial Patterns" tab. Enter dial patterns exactly like the image below. They will allow for you to dial 10 Digits (U.S. Calling), 11 Digits (North American Calling). After entering this info, and hitting "Submit" then "Apply Config". To direct calls from sip.telnyx.com to an extension you must create an inbound route. To start select "Inbound Routes" from the "Connectivity" menu on your FreePBX interface. The image below demonstrates an inbound route that will send ANY call to a certain extension. To direct a specific number to a specific extension you would create a route and set the "DID Number" field to your 11 digit DID with sip.telnyx.com (for instance : 12172031700). In the Above screen shot, 1010 is my test extension created on the FreePBX. After entering this info, and hitting "Submit" then "Apply Config". After following this article, your PBX should be successfully registered, and you can make outbound and inbound calls. If you have any issues, please contact Telnyx support using Chat or ticket. Our Support Team will try to help you on sip trunk configuration.